In February I made my second trip to the Bolivian Altiplano to visit the Lake Poopó Basin, which is adjacent and south of the city of Oruro. This basin was identified in June 2012 as the region for the project I’ve worked on for a year, which aims to assess water risk and hazard over the next 2 years through a field programme of ground and surface water sampling as well as a social vulnerability study. Supported by the Catholic Agency for Overseas Development (CAFOD) and working in collaboration with the Centro de Comunicacion y Desarrollo Andino (CENDA) and researchers at the Universidad Mayor de San Andres (UMSA) in La Paz, the project also aims to share technical expertise and resources, and to focus on community engagement and education. After visiting UMSA in La Paz to see the laboratory facilities and for meetings, I made a 3-day visit with colleagues from UMSA and CENDA to two sub-basins south of the city of Oruro, which will be area for the sampling programme that will commence in June 2013; the Poopó River and the Pazña/Antequera River. On the first day we visited a river sampling area at Sora Sora approximately 20km south of Oruro, which is the meeting point of 3 tributary rivers that feed from the Huanuni mine, a major tin mine in the region. We then drove another 25km south to the Town of Poopó, where waters are typically sodium-bicarbonate type, visiting some shallow boreholes that are used to monitor groundwater impacted by the adjacent Tiwanaku mine. We stopped off at Poopó Town to meet with the community councillor to discuss the project, which is positive for the community as it will support their existing efforts to monitor water quality and their hope for implementing remediation. Local people are poor, they lack support to assert their rights to water and a healthy environment, and there is considerable migration away from the town to cities. They have for a long time dealt with the legacy of mining waste and continued contamination, which is complicated due to the fact that mines are a major source of employment. Growth in mining activities over recent years has continued to be problematic; causing contamination that affects not only water quality directly, but has also resulted in the disappearance of grasslands and livestock. We drove from the village along the Poopó River, passing an area of interesting outcropping geology and where thermal waters come to surface. We then crossed into the Antequera sub-basin, passing an old cemetery for miners before entering the area of the Boliviar mine at the top of the watershed. Mining for lead and discharged waste has led to acidification of the Pazña river (around pH 2-3), which is calcium-sulphate type water. Tailings from the recovery process are transported by pipeline and pumped into an old dam for stabilisation. Acidification of the Pazña River also results from activities further downstream at the Totoral mine where ore is rescued. Contamination is lesser in the lower part of the sub-basin, and crops such as potato and alpha alpha are grown here on a seasonal basis and cattle are also breed. My trip was during the wet season, and intermittent heavy rain and thunderstorms were frequent, causing relatively high river flows and sediment loads and high levels in mine ponds. Upon returning to Oruro we encountered a normal situation in this region, with a general strike, blockade and protest against the building of the local airport. This kind of demonstration also often occurs in relation to mining conflicts and was clear confirmation of the social tension over such issues. On the second day, despite continued protest march, we managed to take back roads out of the city in order to drive to the village of Pazña to take a river water sample. The waters we sampled are the combination of thermal and mine waters and know to be of calcium-sodium-sulphate type, with a pH of 4.5 and anticipated high concentrations of metals such as cadmium (ca. 400 ug/L), copper (ca. 400 ug/L), lead (ca. 3.6 mg/L) and zinc (92,000 mg/L). On the drive back to Oruro the weather improved and there was a clear view of the salt flat adjacent to Lake Poopó. In the evening we met with the Head of the Environment Unit of the Municipality of Poopó to discuss our project and current conflict over the mining situation, which is often tense and difficult. Problems over tailings dams and discharges to rivers were discussed in addition to programmes for reforestation and soil recovery. On the final day of the field visit, we drove to the west side of Lake Poopó where the Desaguadero River inflows as the main tributary contribution to the lake. Fishermen were fishing using large catch nets from the bridge here, a traditional activity for the area for which communities are very dependent in terms of a food source and income. However, dry periods cause low lake levels and increased salinity that negotiate fish supplies in addition to the contamination effect by heavy metals for the food chain. Evidence of the rain season was clear at the Carasilla bridge, where high river flows and a visibly high water table were apparent. This trip was very interesting and allowed the project to develop in all aspects, and I look forward to the challenges that await! Gender and Disasters – What causes the risk gap? 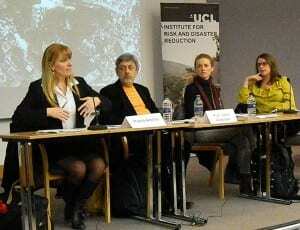 On Friday 8th March 2013, the UCL Institute for Risk and Disaster Reduction hosted an open panel discussion on ‘Gender and Disasters’. The panel was chaired by Dr Ellie Lee (Reader in Social Policy and expert in gender issues from the University of Kent), and comprised: Paula Albrito (Head of the Regional Office for Europe for the UN International Strategy for Disaster Reduction), David Alexander (Professor in Risk and Disaster Reduction, IRDR UCL), and Linda O’Halloran (Director of NGO Thinking Development). The three panellists provided examples of various natural disasters in which women showed a greater risk to the event than men either through active discrimination or through pre-existing factors. This greater risk has been demonstrated through death rates, reported injuries, and post-disaster violence. Questions were raised regarding how this inequality should be addressed. Suggestions were made regarding specific gender-related issues into risk and disaster management and the need for education in such programmes. However, how this should be done and whether there should be a gender-specific programme – either formal or informal – within resilience programmes remained unresolved. Questions were asked whether differences in behaviours between the genders in disasters could affect their relative vulnerabilities; however, I did not hear any evidence-based or convincing arguments to support this. It was highlighted that an individual’s economic status will likely affect their risk to a disaster: the 2011 Great East Japan Earthquake clearly showed an example of this as cheaper properties on lower ground were more susceptible to tsunami than more expensive housing in the hills. It was also noted that there was effectively no gender risk bias for disasters in Sweden, a country with one of the most equal societies with respect to gender. More research is needed comparing the relationship between gender equality and the gender-related disaster risk gap. My belief is that, in relation to disasters, there would unlikely be any significant gender risk gap if there were absolute socio-economic equality between the genders; I am thus suggesting the gender risk gap is a consequence of socio-economic inequality rather than gender. Hence, by directing efforts towards promoting gender equality, specifically addressing the gender-related disaster risk gap becomes unnecessary.